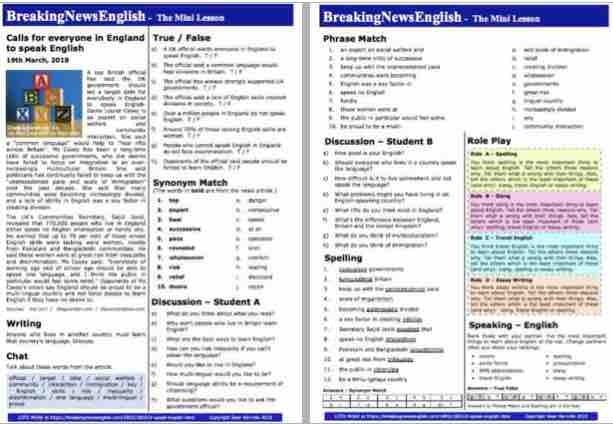 Try easier levels of this lesson: Speak English - Level 4 or Speak English - Level 5. A top British official has said the UK government should set a target date for everybody in England to speak English. Dame Louise Casey is an expert on social welfare and community interaction. She said a "common language" would help to "heal rifts across Britain". Ms Casey has been a long-time critic of successive governments, who she deems have failed to focus on integration in an ever-increasingly multicultural Britain. She said politicians had continually failed to keep up with the "unprecedented pace and scale of immigration" over the past decade. She said that many communities were becoming increasingly divided, and a lack of ability in English was a key factor in creating division. The UK's Communities Secretary, Sajid Javid, revealed that 770,000 people who live in England either speak no English whatsoever or hardly any. He warned that up to 70 per cent of those whose English skills were lacking were women, mostly from Pakistani and Bangladeshi communities. He said these women were at great risk from inequality and discrimination. Ms Casey said: "Everybody of working age and of school age should be able to speak one language, and I think the public in particular would feel some relief." Opponents of Ms Casey's views say England should be proud to be a multi-lingual country and not force people to learn English if they have no desire to.